Acorns Self-cateringAcorns is a very stylish, modern and comfortable apartment on two floors with a private entrance, via a balcony with a bench and good views to Fairfield. Clients who know the area will appreciate how little need there is to use the car - there are fine walks to be had in the surrounding hills - the Fairfield Horseshoe, Loughrigg and Wansfell will beckon the keen walkers amongst you. For less strenuous days try the Rydal Round or a stroll round the Ambleside Heritage Trail which takes you to some of the most interesting old parts of the village. Make the most of the scenery with a delightful lake cruise or come out-of-season to do your Christmas shopping in our delightful individual shops. Accommodation: The entrance hall leads to a very spacious lounge/dining room with leather sofa, large flat screen smart TV with Sky Freeview, DVD and wi-fi. Patio doors open onto a shady balcony with garden table and chairs, overlooking the river. 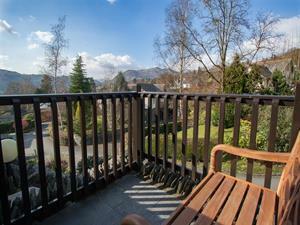 Beautiful new kitchen with breakfast bar area and views towards Fairfield. Upstairs are two very stylish bedrooms, a king size room and a large room with three single beds. Modern family bathroom (bath with shower over, basin, and wc) and second shower room (shower, basin and wc) in the lower hallway. The owners have created an extremely comfortable home from home with ample space for a family or two couples wishing to stay together with excellent facilities including plenty of home comforts, gas central heating and fitted carpets. Outside: Private parking for one car in a numbered space. Ambleside centre half mile down the hill. Acorns is a very smart apartment on two floors with a private entrance, via a balcony with a bench and good views to Fairfield. Acorns offers weekly bookings starting on Saturday.